"A wonderful red snapper dish that is fun to prepare and full of flavor. A classic! A real favorite of my mothers! This recipe looks like a big fuss but it isn't and it is outstanding too! Enjoy!" Preheat the oven to 375 degrees F (190 degrees C). Spread butter into the bottom of a 9x13 inch baking dish. Arrange fish fillets in a single layer over the bottom of the pan, and sprinkle with salt and pepper. Bake for about 12 minutes in the preheated oven. Meanwhile, whip egg whites in a clean dry bowl until stiff peaks form. Fold in the parsley, mustard and tarragon. Spread the egg white mixture over the fish in a layer about 1 inch thick. Sprinkle bread crumbs over the top. Return to the oven, and bake for about 6 more minutes, or until meringue is golden, and fish flakes with a fork. Good flavor but I think I must have done something wrong with the meringue because it turned out kind of hard. Probably because I had to cook it a little longer. Delicious and fun new way to cook fish. I broiled the top for a few minutes at the end because the top wasn't turning brown and I was worried about over cooking the fish. 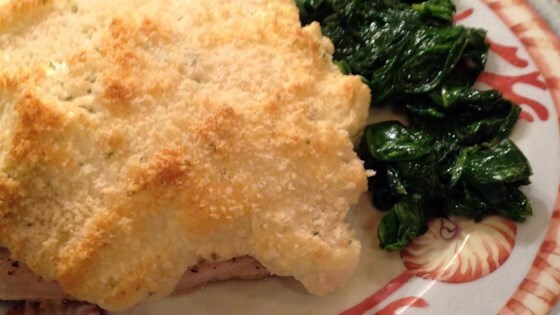 I would suggest using Panko crumbs; much lighter than bread crumbs. A little dried dill wouldn't hurt either. i wouldnt waste snapper on such a mediocre recipe again. this was bland and thoroughly not worth the effort. I'm not a very good cook, and I think I didn't whip the egg yolks until they peaked properly, but I still thought this was really good.